Today mSpot released the latest in their suite of products, mSpot Radio Spotter. 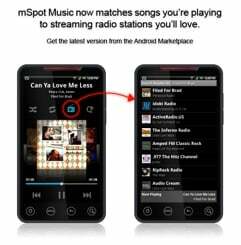 mSpot Radio Spotter is a free part of the mSpot music app and broadens your access to not only your own music stored in the cloud, but also streaming radio finely tuned to your listening habits. What helps to set mSpot apart from the other music solutions out in the Market is that mSpot combines a full cloud storage locker with a personalized radio station or stations that match the style or genre or whatever song you're listening to or the kinds of music you listen to most often. The mSpot Radio Spotter Discovery Feature is easy to use, as you just click the radio icon when you're listening to a song, and mSpot will populate a list of songs similar in taste to what you're listening to. mSpot has also partnered with more than 80 commercial-free online radio stations and live, local radio stations to stream their content to you from the 'Radio' section of the app. mSpot Radio will also generate a list of suggested stations for your use based on what you listen to the most from your cloud storage locker, so the more you use the cloud service, the more fine-tuned your suggestions are. This is a pretty big step forward in uniting cloud storage and streaming radio into a single entity, and it works rather well. Now, we can only wait to see if any other products come up to challenge. Full PR and download links are after the break. Palo Alto, Calif. (May 26, 2011)—Popular cloud entertainment provider mSpot, Inc., today announced Radio Spotter™ Beta – the first digital music service to combine a cloud music and storage locker service with streaming radio. The new service offers two main features: Match the songs you’re playing from your personal online music collections, to similar music playing on hundreds of radio stations across the Internet; or, instantly select Internet radio stations you’ll like, based on music genres or your own artist searches. Radio Spotter puts the metadata in your music collection to work by matching whatever you’re listening to, and quickly adapts to offer new recommendations based on your changing preferences. “Radio is still the easiest and most popular music discovery tool - people love its spontaneity and variety. Yet, it can take years to discover the best radio stations. We’re giving people a mash up between Cloud music and streaming radio: It’s a great way for people to find new music and enjoy their own - all in one service,” stated Daren Tsui, CEO and co-founder of mSpot. How does Radio Spotter work? Put your music collection on the Internet: Go to www.mSpot.com and upload your music collection from your PC/Mac® into your own personal music locker in the Cloud. Now, you can access it anytime, anywhere from your Android or any PC/Mac. Download the mSpot Music Android App on your phone. Your music will appear on your phone. As you listen to your music on mSpot Music, the service will match the songs and artists you’re playing with similar music on hundreds of Internet radio stations. These stations will be available in the “Stations Suggestions” tab. The service keeps track of what you’re listening to and gives you new recommendations as the music you’re listening to changes. Favorite stations can be saved for easy reference on the app homepage. New songs can be flagged for future reference and automatically synced to their online accounts at www.mspot.com for later purchase, through Amazon or iTunes music stores. The “Browse Stations” tab offers an instant selection of Internet radio stations, which are always available through the service without matching songs to your own music collection. You can also search by favorite artists to find radio stations playing music by that artist, or similar artists. Genres range from Alterative and Rock to Dance and Electronic, Pop, Urban, Country, Reggae, Latin, Jazz, Spiritual, 70’s, 80’s, 90’s, Youth, Bollywood, French and Canadian. Unlike Pandora and Slacker; Play all of your own music alongside new music that is discovered on real radio stations: Your own music collection is the basis of all the new music you find and listen to. Unlike iTunes; Store your music collection in the cloud so that you can always access it, wherever you are. Your music is connected to the Internet, so you can match your preferences to hundreds of Internet radio stations to discover and play new music for free. Unlike subscription services like Rhapsody, MOG and Rdio; Listening is free. Match the music you already love with music playing on radio stations all over the Internet. Unlike Cloud storage services like Amazon or Google; Listening is not limited to your own music, or music for purchase; your music now connects you to hundreds of radio stations. Radio Spotter Beta is available in the Android Market for Android users, in the United States only; iPhone, PC/Mac and other internet connected device support will be offered later in 2011, along with new premium features. mSpot Music is available at www.mspot.com for PC and Mac, in the Apple® App Store and Android Marketplace. Instant access to music collections from mobile, PC/Mac® and Web-ready TV. Smart syncing across devices: No USB cords required; instantly syncs music from the cloud to user’s mobile; avoids playback interruptions. Automatically exports playlist, metadata, cover art, and more from iTunes. Continuous playback, even during spotty cellular coverage. Airplane mode: play cached songs on the phone without network connectivity. “Live Lyrics”: read the words to select favorite songs as they play on mobile. “Streaming only” option for users who want to save all the storage on their mobiles for other media. mSpot Music offers free cloud storage for the first 5 gigabytes (approximately 4,000 songs): Additional storage is available for purchase; 40 gigabytes for $3.99 per month. The leading cloud entertainment provider, mSpot, Inc., delivers music, movie and radio content instantly to users - bringing effortless, Cloud-based syncing across all devices. The company offers three innovative entertainment services: mSpot Music ™ - the flagship music service, enables people to upload their entire music collections online and listen wherever they are; mSpot Movies™ - a premium Video On Demand (VOD) movie service; and mSpot Radio™ - an all-format radio service that includes over 400 channels of music. mSpot cloud entertainment services reach more than six million customers. Headquartered in Palo Alto, California, more information is available at www.mspot.com.